How to solve the baby poop at night problem. 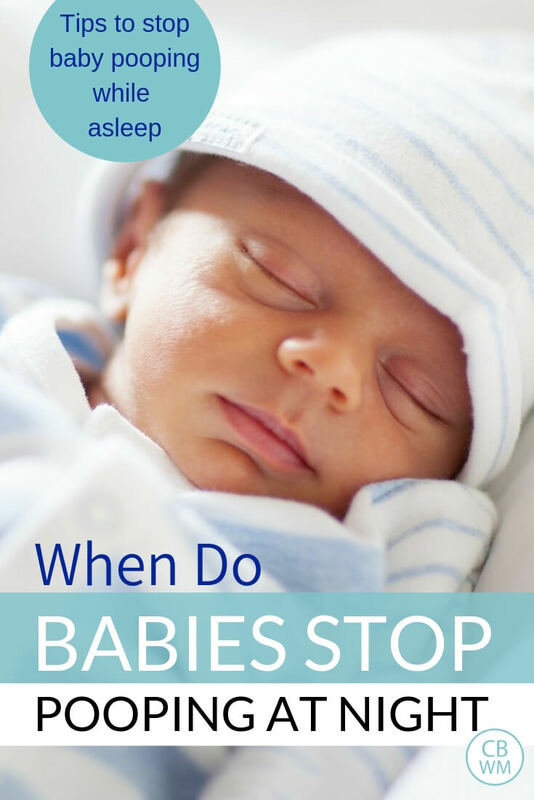 Learn when do babies stop pooping at night and how you can help speed that along. It can be frustrating when your baby poops at night. You need to change the diaper and wake baby up even more than baby is. You might have what feels like a thousand little snaps to do up on those cute pajamas baby is wearing at night. The whole process takes much longer to change a poopy diaper and you would love to get baby back in bed and therefor you back in bed ASAP. You do not want baby pooping in the night to wake baby up an extra time beyond feedings. Is Baby Pooping While Sleeping Normal? If you haven’t noticed yet, a newborn usually poops soon after eating. 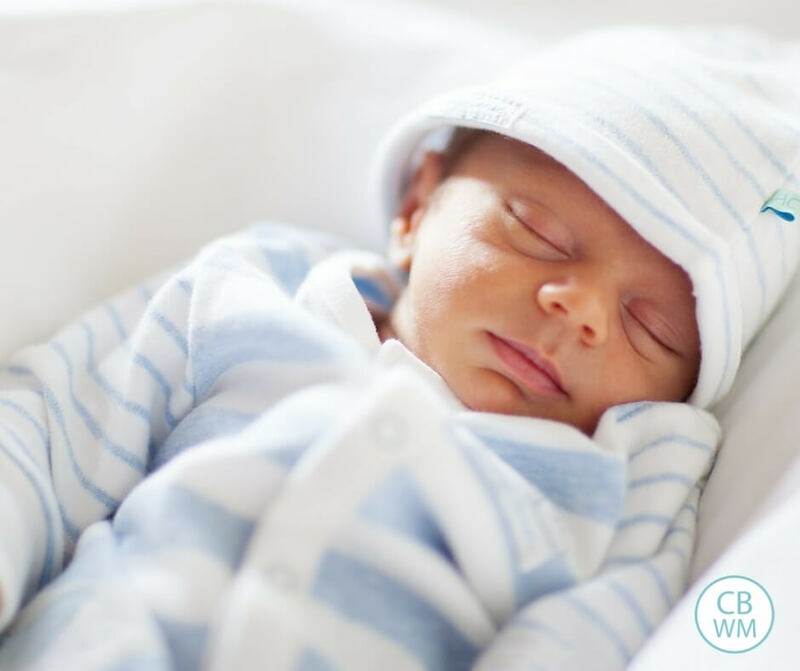 This is a huge benefit to the eat wake sleep cycle during the day because your baby eats, then is awake, and then goes to sleep. That means the pooping, which happens soon after eating, can happen before sleeping. At night, however, you do not have the benefit of some wake time before baby goes back to sleep. You want baby to eat and go right back to bed. It can be very normal for a baby to poop while asleep. As your infant gets older, that should move to being abnormal. If your baby is older and has started pooping at night again, read on to find solutions to stop that. In the first month of life, you will find poop likely happens frequently and is no respecter of time day. By the time your baby is around one month old, you should be seeing poop happening more often in the day than the night. Over time, you see see the night poop leave, but you can see it pop back up when your baby is older. If your baby is six months old and started pooping in the night again, it might be because of teething or new solids. So it can be normal at various ages for various reasons. Scroll down for more help on why it happens and how to help. If your baby does not poop every time he or she eats, do not stress! Not all babies poop every time they eat. There is a wide variation in how frequently a baby poops. As your baby gets older, your baby will poop less. Infant poop gets thicker as the baby gets older. Your baby will move from pooping multiple times in a 24 hour period to once a day or even less frequently. I find babies poop less frequently when they are having a growth spurt. How Long Can Baby Sleep in a Poopy Diaper? The longer a baby sits in a poopy or wet diaper, the more opportunity there is for the contents of the diaper to irritate the skin. I always used a diaper cream on my baby during the night to prevent the wet diaper from bothering baby’s skin. During the day, be sure to change baby’s diaper every feeding cycle. You might change baby’s diaper in the middle of the eating session (I do this with newborns to wake them up), right after an eating session (this might be necessary if baby pooped right after eating), or right before nap so the diaper is fresh for nap time. If baby has a poopy diaper, you want to change it. If baby is asleep and you are asleep and you do not know baby has a poopy diaper, there is nothing you can do. But if baby is awake or even if you smell that dirty diaper because you checked on baby, it is a good idea to change the diaper. Should I Change a Poopy Diaper at Night? Baby poop overnight can be annoying because it can wake baby up. Absolutely change that poopy diaper at night. If you go in for a dreamfeed at night and baby has pooped, change the diaper before you put baby back in the crib for the night, even if you do not typically change the diaper at the feeding. Change the diaper if poop is in the diaper. If you opened the door to peek in before you went to bed and you can smell poop happened, change the diaper. The acid from the poop can really irritate the skin. When you change a diaper at night, try to avoid eye contact or fun interactions. Keep things mild, interaction minimal, and keep lights as low as possible. Change the diaper and get baby back in bed. You might need to do some bedtime routine to help settle baby back in. Wet wipes can be cold and wake baby right up! You can hold a wipe in your hand to warm it up for a bit before using it. Also, dress your child for sleep to make those night diaper changes as easy as possible. A nightgown or sleep sack can be super helpful. I found I much preferred a zippered sleeper to the button sleepers. I wouldn’t use a sleeper with buttons until my baby no longer needed diaper changes at night. Sadly, I cannot give you a magic age to look forward to. There are some key things that help lead to no more poop at night. One is getting baby to have days and nights figured out. Fix that day/night confusion and you will have baby pooping less at night. Another is having fewer feedings at night. This naturally happens as baby gets older. If you follow the Babywise Method, you will find you get baby sleeping through the night quite young by most standards. Why is baby pooping at night? That is the first question you want to ask yourself and answer before you take a course of action. Sometimes you need to make a list of possible reasons and address them. You might not know why there is baby poop at night until you use a way to fix that issue and it works. So first, ask yourself why does baby poop at night? 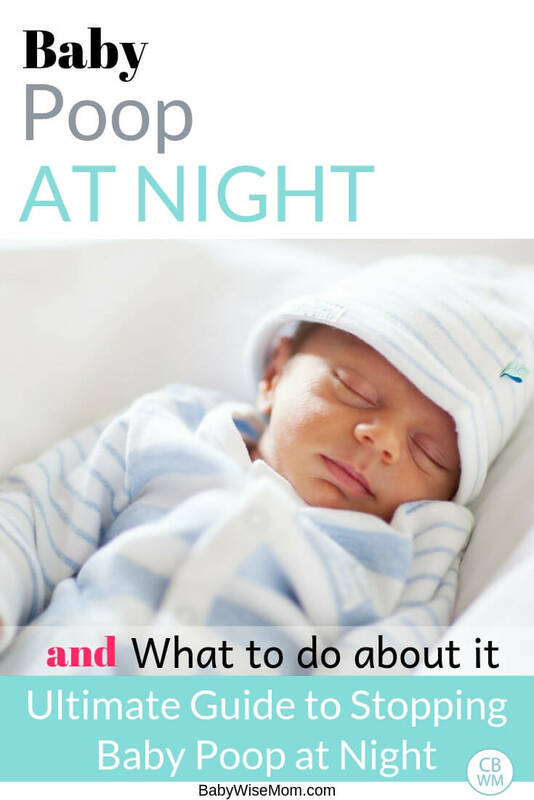 Let’s talk about ways to get baby to not poop at night. Age: As your baby gets older, he or she will naturally just poop less often and this will lead to baby pooping less at night. Eat/Wake/Sleep Cycle: As I mentioned above, if you follow the eat, wake, sleep cycle, your baby will be more likely to poop during that wake, or play, time rather than the sleep time. So no popping during naps or night time. Independent Playtime: Let’s be real. How many humans really like to poop around other humans? We tend to do so in privacy and when we are alone. An infant or newborn isn’t really like that, but as babies get older, you might find you have luck with having baby do independent playtime each day. All of my babies transitioned to pooping during independent playtime as they got older. Some time alone during playtime might be just what you need to avoid that poop from coming while baby is alone during sleep time. Watch Your Diet: If you are breastfeeding, you might notice that certain foods you eat lead to poop from your baby so long afterward. Pay attention and see if there is a pattern. Watch Baby’s Diet: If baby has solid foods, you can probably have a big impact on if baby poops while sleeping, especially at night, if you change around some things with solid foods. If baby wakes up trying to poop, you want to try to make sure baby poops while awake, instead. Some foods are known to cause pooping more than others. There are foods doctors recommend to relieve baby constipation. You do not want to feed those foods to your baby close to bedtime. Take note of what you feed baby and when the bowel movement happens. If your baby tends to always poop within five hours of eating peas, do not have peas ever be on the menu at bedtime. You can use these foods to help you by strategically feeding them in the morning. Have fiber at breakfast to ensure baby poops during the day and won’t need to at night. Other foods can be perfect for dinner to slow down bowel movements at night. Some moms find sweet potatoes or other starchy foods are great at dinner. Also, consider if a certain food is upsetting baby. If you introduced a new food and baby’s bowel movements have gotten very loose and smelly, that might be a food that isn’t agreeing with baby. Fix Constipation: This may seem counterintuitive, but if baby is constipated, you might have baby pooping at night because poop needs to come when it needs to come. Fix Sleep Issues: Your baby might be happening to poop at night or poop during naps just because baby actually woke up for some reason. If baby drifted off to sleep instead of waking up at a transition, then baby would be less likely to poop. Correlation is not causation. You might think the pooping woke baby up when in reality it was something else and baby just pooped because he was awake. It could be it was the poop that caused the waking, but it could be something else. Read up on how to deal with the 45-minute intruder, troubleshooting naps, and fixing nighttime sleep issues. Alleviate Teething: Teething can lead to more drool which can lead to looser stool. That can lead to baby pooping at night when that wasn’t previously an issue. You can try to help alleviate symptoms of teething, but a lot of this is just a waiting game if teething is leading to baby poop at night. If you can help baby drool less, you might be able to help the poop at night. You might find certain foods your baby eats help offset all of that extra drool. Starchy foods can help with that, so sweet potatoes might be your friend while teething. Sickness: If your baby is sick, this can lead to baby pooping at night. If baby has a virus upsetting the digestive system, you either need to see your doctor about ways to stop that or wait it out. If baby has a cold and mucus is dripping into the tummy, you might have increased frequency and looser stools. Some things you just have to wait for. In some cases, you just need to wait for baby mature some and stop pooping at night. In other cases, there are obvious causes for that pooping at night and you can stop it. These tips in this post can help you get baby sleeping through the night rather than pooping through it. Do you need more sleep help? Buy my eBook Babywise Mom Nap Guide here for help establishing great naps. Next Post 5 Tips for Making Laundry Easier and More Tolerable! This entry could not possibly be more timely. I just started our 6wo on a schedule a few days ago. One of the biggest challenges is that our baby is extremely sensitive to wet and dirty diapers. During the night he wakes up multiple times due solely to a dirty diaper (not because he is hungry). So instead of waking up 2 times to feed, we are up in excess of 5 times between his dream feed at 10p and 7am wake up time. Last night, he woke up at 1:15a to be changed and I went ahead and offered a feeding to reduce the likelihood that he would wake up hungry immediately after putting him down. He showed no signs of hunger initially, but fed well once it was offered. Should I be offering him a feeding under these circumstances? He then woke up 3 more times before his 4a feeding with dirty diapers. When dirty, he fusses & squirms and eventually starts screaming if ignored. Baby has been super intolerant of any wetness or even the smallest poops since day 1 but generally sleeps better through a dirty diaper during his daytime naps. Any idea why he gets so irritated at night? Btw, we are currently using nighttime diapers and I see no irritation on his bottom that would explain a heightened sensitivity. Something I would wonder about is correlation versus causation. Since he tolerates dirty diapers in the day better than at night, I would look at what else could possible the cause of the night fussiness. It might be diapers, but it seems odd he would handle it better in the day. So look at what is different between night and day that might be leading to fussiness. I think if you offered a feeding and he wasn’t hungry and it didn’t extend night waking, I wouldn’t offer the feeding at that same time tonight. Just change the diaper and put back to bed. I would take notes so you can see if there is a pattern or a good time to feed baby. Good luck! I probably overstated his dirty diaper tolerance during the day vs. the night, but I absolutely see your point. The first thing that comes to mind is that at night he is in his Halo bassinet as opposed to day naps which are often taken in his Dock a Tot. There’s no question that he prefers the Dock to the bassinet. If my inference is correct and the fussiness is actually in response to the bassinet, would I be correct in assuming that letting him fuss in the bassinet is probably the best/only way to curb this problem? I know moms have different viewpoints on CIO, but if I know my baby’s basic needs are met, I have comfortable using CIO to establish good habits.